Description: Shrubs or small trees can grow up to 15 feet tall but usually remain in the 5- to 8-foot range. These plants have light green foliage that is densely pubescent on the underside and less so on top, making the underside even lighter in color. The most attractive feature of this plant is its beautiful white, fragrant flowers which emerge at the tips of branches. In the morning, the flowers open and are a brilliant white, and by the end of two days, they slowly fade to a light pink and begin to close before falling off. The petals of this hibiscus are robust and thick, which enable the blossom to stay open as long as it does, adding to its stronger-than-normal fragrance. The stamen is reddish pink, so it stands out against the white petal, but it is shorter and sturdier in appearance than other native whites. 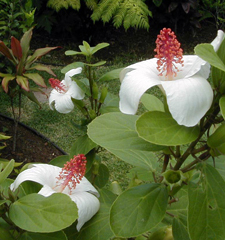 Distribution: This rare native white hibiscus is endemic to the dry forests of Waimea Canyon on Kauai. It grows wild nowhere else in the world. Landscape use: The koki'o kea can be trimmed into a beautiful, colorful hedge or left alone to be admired as a specimen plant. It is wind-, sun- and drought-tolerant and is resistant to the unattractive bumps from gall mites that seem to plague most hybrid hibiscus. This is yet another perfect native plant for the xeriscape garden, or any garden for that matter. Hint: Plant koki'o in front of a dark background such as a rock wall or ti hedge to really show off the flowers. Watch out for aphids and whiteflies. If you do notice them, shoot the bugs off with a water hose or spray them with pesticide. Follow directions on the bottle for the best results. This plant is available at Home Depot in Iwilei and Pearl City for a limited time for about $12. Cultural uses: The hibiscus flower was eaten as a laxative. Some sources say the native red hibiscus was eaten by girls and women, while the white was eaten by boys and men. The flowers were also strung into leis, but these days they are most often placed behind the ear. Also: The native white blossoms, which include Hibiscus arnottianus (found on Oahu and Molokai) and this species, H. waimeae, are the only fragrant hibiscuses in the world. But the koki'o kea flower is the most fragrant, making it the most naturally fragrant hibiscus in the world. Sweet! An endangered subspecies of this plant, H. waimeae subsp. hannerae, is also found on Kauai and has a much smaller flower which is still quite fragrant.